It's been wayyy too long! I've truly missed the weekly ritual of Sips and Sounds and am ready for the return of regular installments. While my music taste is generally pretty predictable (folksy, melodic, lyrical, poppy and so on), lately I've been leaning more toward the post-punk persuasion. 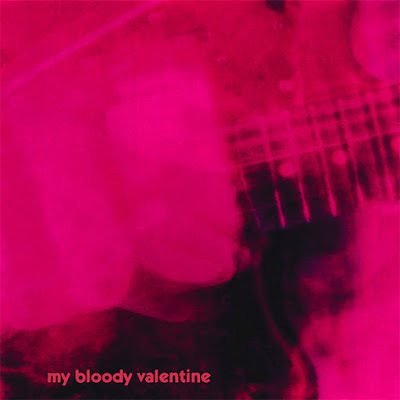 My Bloody Valentine is a band I've casually listened to in the past, but I've gained a new-found appreciation for their sound. As for the drink, I was craving the creaminess of an egg white concoction and wanted something bloody-colored, so this fairly straightforward but tasty beverage was born. In a shaker, combine 1.5 oz bourbon, 1 oz tart cherry juice, 1 sugar cube, 1 egg white and a dash of bitters. Shake well without ice, then add ice and shake thoroughly again. Pour into your glass, top with a few more drops of bitters and enjoy!